I am super thrilled and honored to be sharing my first post with you as a Design Team Member for Dare 2 B Artzy! I was fortunate to do a Guest Designer spot for them back in November of last year. They graciously invited me to be a part of their DT for this term. For my first project share, I made this fun card featuring their new Seas the Day Collection. My finished card size is an A2 top folding card that starts with a white cardstock base. 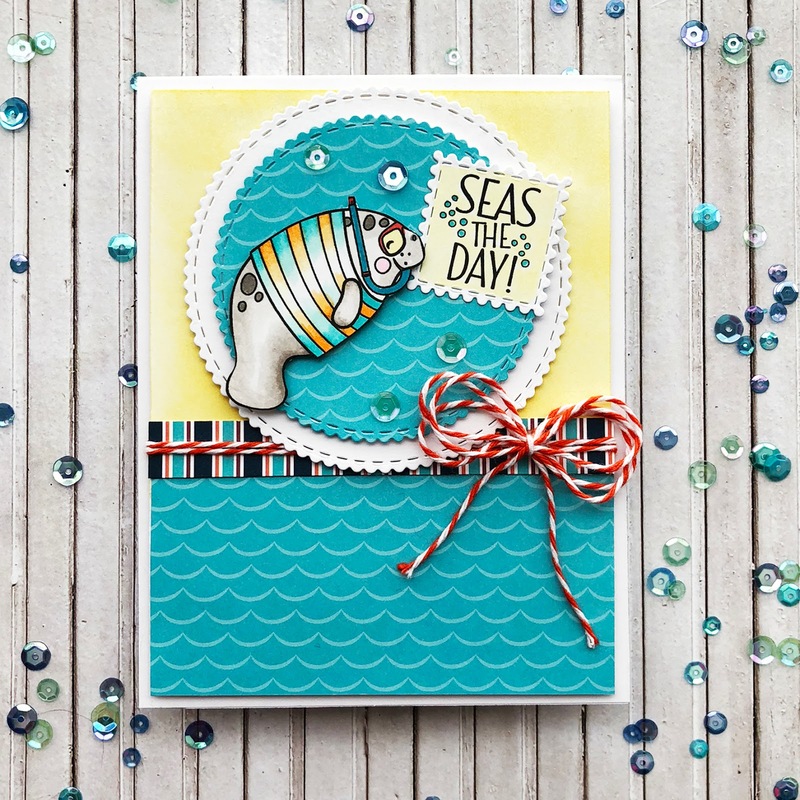 I then used the new Seas the Day stamp set and stamped out the cute little Manatee image. He is so stinkin' adorable with his t-shirt! I colored him with my Copic markers. I mounted him onto a scalloped circle cut from the wonderful designer paper from the collection. I added another white scalloped circle. You can see here I added a few little sequins for some extra flair. I then stamped the sentiment from the stamp set out and colored the background with a light dusting of my chalks. For the little bubbles, I used my Copics. You can also see for the background mat, I inked a piece of white cardstock with the Sunset Yellow Ink Pad. Such a vibrant and cheery color! For the bottom half of the card, I used some more of the designer paper and then added a piece from the border strips of another paper in the collection. I added a border of some Twine for a little extra touch. Here is one last look at my finished card. It is pretty simple and would be very easy to recreate! Such a fun and encouraging sentiment. I love how this card turned out. Make sure you head over to the D2BA shop and pick up this perfect collection! While you're there, you may want to check out several of their other great new collections.